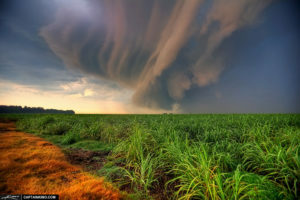 A sugar cane field in Florida, where famers have been working with regulators to reduce fertilizer runoff. An explosive bloom of blue-green algae in Florida’s Lake Okeechobee and surrounds, fueled by the combination of high pollution levels and warm temperatures, made international headlines earlier this year. Excess fertilizer runoff from south Florida’s sugar-producing region has long been a key contributor of nonpoint source pollution, despite decades of policy and environmental initiatives. However, a recent study by Florida Coastal Everglades LTER researchers explores a rare success story where industry and regulatory stakeholders in Everglades Agricultural Areas (EAA) have worked together to reduce agricultural runoff and improve water quality in the region. In contrast to persistent water quality impairment elsewhere, Everglades water quality has improved steadily over the past 20 years. These improvements have taken place under a complex set of governance arrangements that established a mandatory long-term water quality target but which relied on shared compliance among farms. These conditions encouraged interactions among three key groups of stakeholders—farmers, agricultural extension agents, and state regulators—to implement management changes. Trust, reciprocity, and shared social norms (i.e., values and behaviors) are considered critical elements of ‘social capital’ needed for stakeholders to cooperatively address broad environmental problems such as agricultural pollution. Through a series of interviews, researchers found that bonding social capital among farmers encourages them to improve their management through a sense of shared responsibility, as well as a certain amount of peer pressure. Farmers tended to share insights and strategies on water management with each other via regional forums and training opportunities. They also used phosphorus load monitoring data from the South Florida Water Management District to compare their farm’s numbers to those of their peers, creating an element of competition to keep phosphorus concentrations lower. At the same time, the strong bonds among farmers potentially limit further restoration by maintaining perceptions that the current suite of regulations is unfair. Farmers tended to band together with the shared opinion that regulations were unfairly targeting agriculture while ignoring pollution from septic systems and urban environments. However, the consultative relationships between state regulators, extension, and farm community leaders (deemed ‘bridging social capital’) were an important component in identifying practices that were seen as socially acceptable by farmers. These practices—which included saving money from pumping less water, banding instead of broadcasting fertilizer, and land leveling—appeared to shift the narratives around what constitutes good farm management. This study suggests that regulatory pressures from litigation incentivized farmers to connect with other farmers, extension agents, and regulators, while the consultative process helped to legitimize their participation. Tracing these different forms of bonding and bridging social capital can be a valuable method for predicting how successful cooperation will be among various stakeholder groups, and how different government arrangements can improve stakeholder interactions to better address nonpoint source pollution problems. Landon Yoder, Rinku Roy Chowdhury. 2018. Tracing social capital: How stakeholder group interactions shape agricultural water quality restoration in the Florida Everglades. Land Use Policy 77: 354-361.